Also called laminated tubing, this type of tubing consists of two strips of coiled steel, on atop the other, rolled together in a tube mill producing, in effect, one tube inside another. Double-wall tubing is most commonly seen in the automotive industry for exhaust systems. 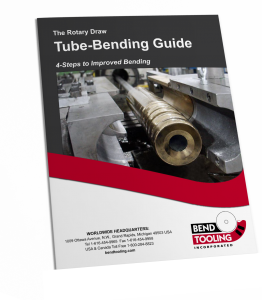 The tooling and set-up for rotary-draw bending of double-wall tubing is the same as regular tubing except for the specification of the mandrel assembly. Because, obviously, material cannot flow from one wall to the other as it becomes plastic at the point of bend, the total thickness of the double-wall is not relevant for specifying how much mandrel support the tube requires. Instead, the thickness of the interior wall should determine the number of balls, nose and ball diameters, and the nose placement of the mandrel assembly. In other words, for purposes of mandrel specification, the inside wall should be treated as a thin-walled tube.